This semester’s Student Investment Fund class has just added Microsoft (MSFT) and Accenture (ACN) to their Buy list. Next step is to identify entry points for these stocks. Our investment process accomplishes this by using some basic long- and short-term technical analysis indicators. A chart of MSFT’s weekly closing price, along with the 50- and 200-week moving averages of price, is shown below. 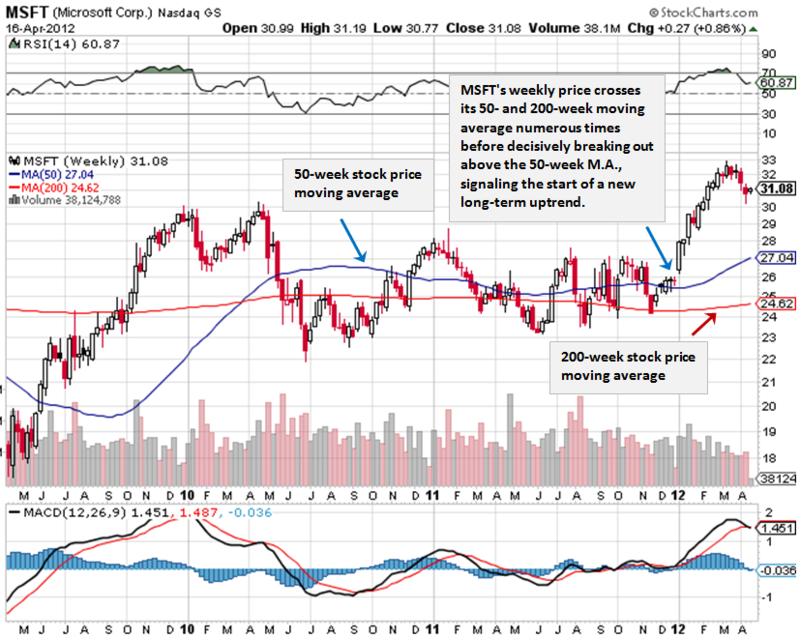 MSFT began a new long-term uptrend in early 2012 when its price broke above its 50-day moving average. Although MSFT’s price has retrenched recently, the long-term uptrend remains intact. This is corroborated by MSFT’s relative strength indicator (RSI, top panel of the graph) vs. the market of 60 (> 50 indicates relative outperformance), and their positive MACD (lower panel) of 1.45. After establishing the stock’s long-term trend, we move on to an analysis of their short-term trend. The chart below shows MSFT’s daily price along with their 50- and 200-day moving average. MSFT remained in a short-term uptrend from the start of the year through mid-March (rising channel delineated by the parallel red lines), when its price broke below the lower channel. 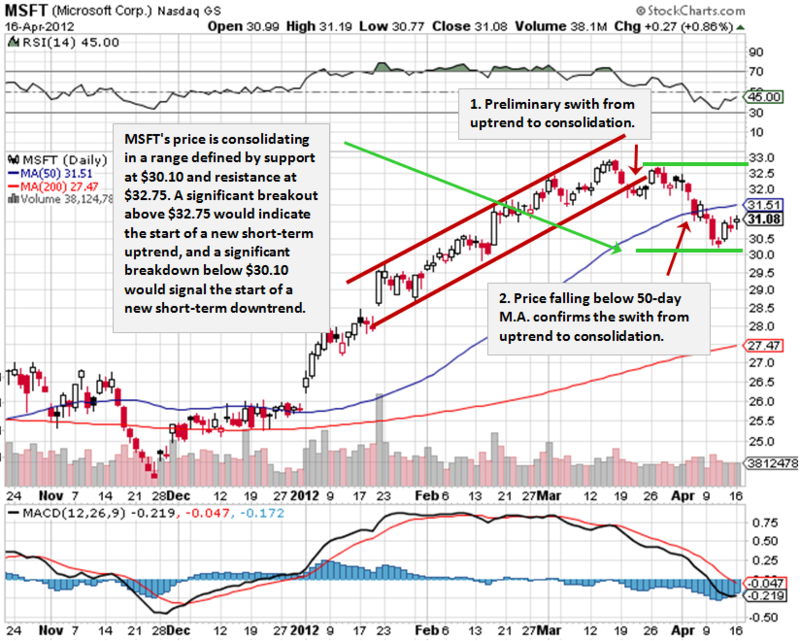 Since that time MSFT has been consolidating in a range defined by support at $30.10 and resistance at $32.75. MSFT’s weak short-term price momentum is further confirmed by their RSI of 45 and their weakening MACD, which recently turned negative at -0.2. Next we’ll apply the same process to Accenture (ACN), shown in the chart below. 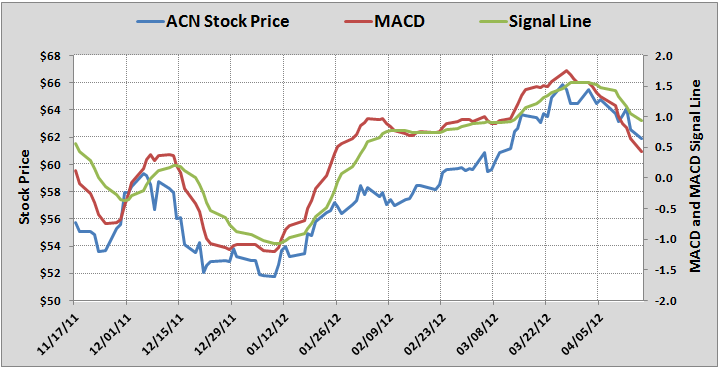 A 3-year chart of ACN’s weekly price shows that the stock has been in a significant long-term uptrend. Although the stock is currently trading near the low end of the uptrend channel, the long-term uptrend remains intact. This is corroborated by the price above its 50- and 200-week moving average, an RSI of 56.8, and an MACD of 2.16 (above its signal line). A 6-month chart of ACN’s daily price, depicting its shorter-term trend, is shown below. This chart tells a different story. 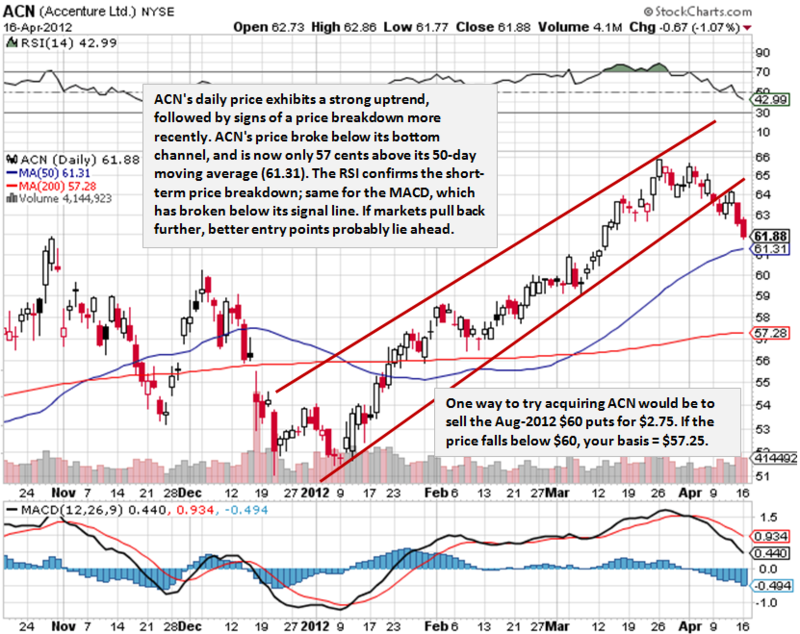 ACN has broken below its short-term uptrend channel, and the price is just 57 cents above its 50-day moving average. ACN’s daily RSI of 42.9 indicates a deteriorating short-term trend. ACN’s faltering price momentum is corroborated by its MACD of 0.44, which broke below its signal line in late March and continues to decline. 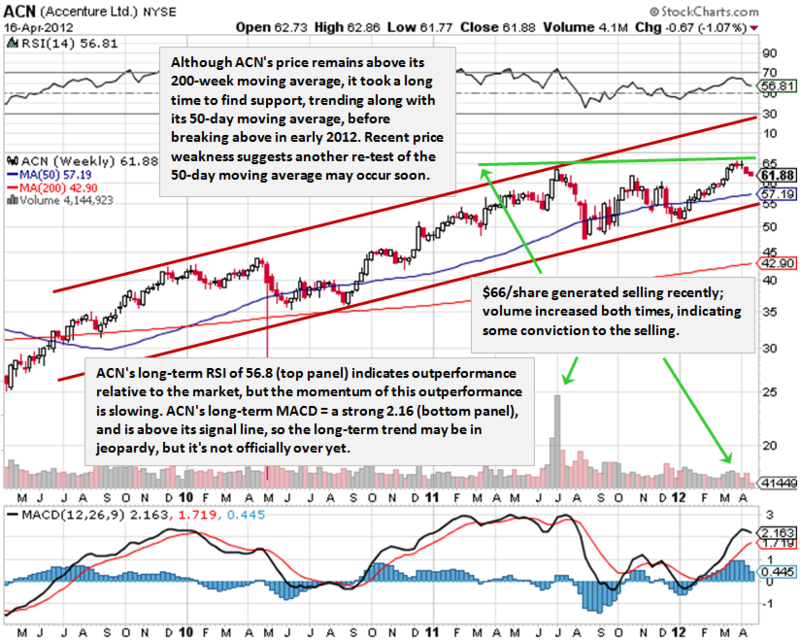 The chart below provides a closer look at ACN’s MACD. The late March break below its signal line is evident. 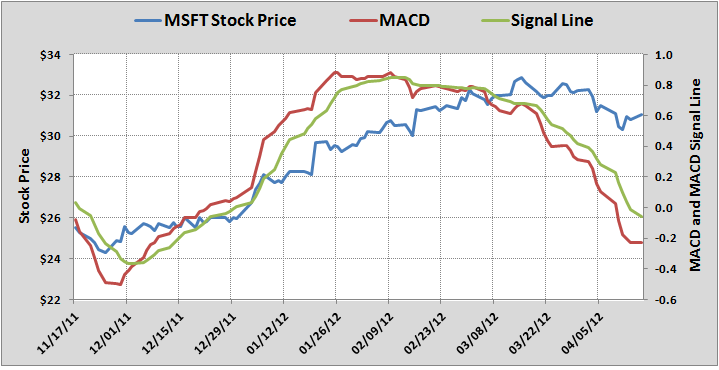 The evidence suggests that, similar to MSFT, it may be possible to acquire shares at a slightly better entry point.